Didn't say anything yesterday but all that I could find was one which terminated short. One passenger said: "Currently on a train at Exeter Station without a driver. 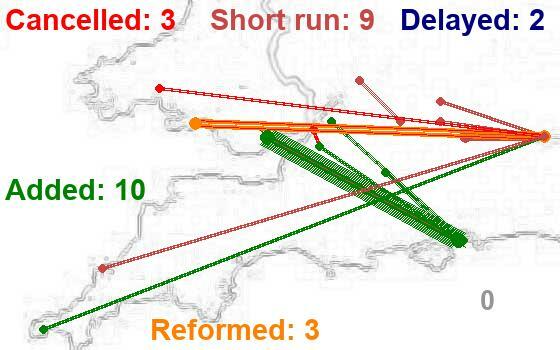 How can you provide a Penzance to Paddington service without the foresight to have a driver for the whole journey? Another passenger, Stephen Thomson, wrote on Twitter: "Apparently the driver of my train from Exeter to London has gone missing. Can I have a go please? I'll be really careful!!!" Meanwhile Sheila O'Connor did not see the funny side. More Twitter ‘journalism’ Big deal, Often happens. At least there was a driver to take the train forward after a reasonably short delay. I don’t think XC will be too pleased an image of one of their trains was used either. News organisations must pay people to trawl through company Twitter feeds looking for a story. Lazy journalism. I really enjoy being a part of this forum but one of the things I find quite bizarre is the venom with which any external person/organisation who/which highlights a failure of the railway tends to be descended upon - if it's an individual, their character/motivation/integrity is immediately called into question, if it's any type of media, it must be biased, worthless untrustworthy or lack objectivity (Twitter is the part of the future of instant news, best get used to it, not everything takes 24 hours to appear in the Press/TV any more, the world is changing very quickly!) - the ignorance of the travelling public is generally taken for granted and sneered at, whereas a judicial level of proof seems necessary before the failure of any member of the "railway family" is acknowledged. Perhaps it's a societal thing - it almost mirrors the behaviour of Corbyn's Momentum mob, whereby any criticism of Magic Grandpa means you must be Blairite or a "Tory" (now a generic Corbynista term for anyone not on the far left) and any media criticism can only be explained by the extreme bias of the "Mainstreammeeja" - the possibility of failures closer to home which need addressing is treated as heresy. In my own organisation, things go wrong. Not too often, but more often than we'd like. When they do, we don't get defensive, we learn from it, and if possible build it into service improvement and make things better for our customers...........we encourage and welcome feedback, and we let people know what we've done as a result. Then again, we care about our customers, they're the reason we exist and of course we have competition...............what a shock most of those employed on the railway would have if that was the case! Anyway, just an observation - not pointing at any one individual, look upon it as an outsider looking in - who pays £thousands over to the railway every year - have a great Saturday night all! the world is changing very quickly! And sometimes for the better as well. Though without wishing to come across as venomous, I must admit I find articles like the one Phil linked for us pretty pathetic. That's not in defence of the railway - it can equally be applied to other news genres such as politics, health, education, showbiz etc. It increasingly seems to be a world where we get fed stories using very little other than Twitter quotes, dubious facts, and 'click bait' headlines - even from some of the more 'serious' news outlets. That's not a change for the better IMHO. A measured reply as always II, but I don't think there's anything too dubious or pathetic about the story, and I'd respectfully suggest that the fact that customers have been delayed for almost half an hour, inconvenienced and will quite possibly miss connections or other commitments as a result as well as being treated flippantly by GWR staff is more important than any subjective reservations about the source from which the information comes........so often this seems to be overlooked. - Play the ball, not the man! One of the reasons I posted the link with the comment 'Make of this what you will' was simply because there were so many inaccuracies in an article that was supposed to highlight the problem of a shortage of train crews. 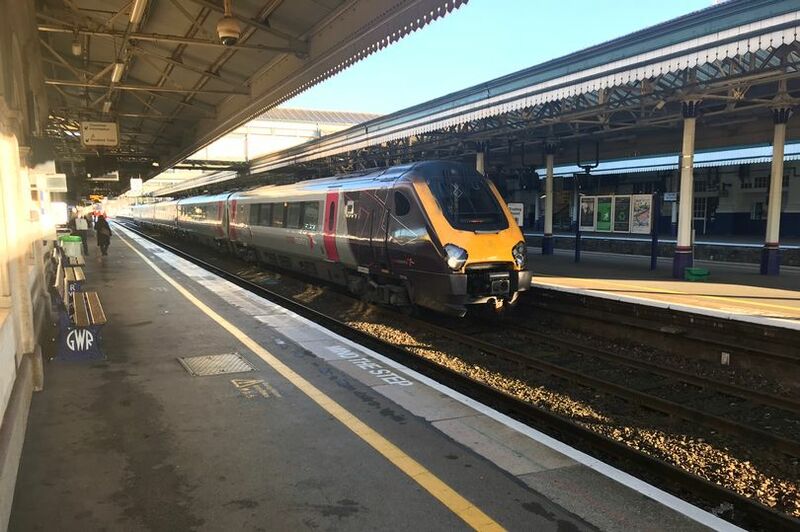 The simple fact that the train arrived at Exeter at 14:56, already 6 minutes late and then left at 15:16 (NOT 'shortly before 3.30pm' as the article suggests) just 21 minutes late. Hardly a major problem in the grand scheme of things. So, if they thought it a story worth running with then perhaps 'Train at platform for 20 minutes' would be a more accurate headline than 'Train stranded at Exeter St Davids after driver 'goes missing'. I have to say I thought the Twitter responses were spot on. Perhaps some would see it as flippant, but to me a light-hearted and humourous tweet from Stephen was given a light-hearted and humourous response. And a response that was sincere and apologetic was given to Mary who I presume made a more serious tweet. All very subjective of course, but I'd be wary of sending "light hearted" tweets to customers in these circumstances. Fact remains however that people here seem more concerned about minor inaccuracies and rubbishing the source than the inconvenience and concern to which customers were put - sometimes it's best to see the bigger picture, and ask yourself what matters more. No-one's suggesting that this was a Pulitzer prize winning article, but let's try to get priorities the right way around? That's not how Twitter works, is it? Everyone is listening in, and with different trigger filters for irony and tongue-in-cheek comments. So what may well have started with one passenger mischievously misunderstanding an announcement about needing to find a driver as "gone off and not told anyone", so as to make a joke about "can I have a go", ends with a lot of misunderstandings. Of course drivers do sometimes go missing in that sense - you hear the PA messages for them. But if the word "missing" was used in an announcement, its range of idiomatic uses does make misunderstandings, genuine or willful, likely. There was a fatality earlier on that day near Newbury, that might have had an effect on crew availability. To be fair, announcements on-board, apologising and keeping passengers up to date with estimated arrival time of replacement driver would have helped. If the fatality earlier in the day was at the root of it all, frankly it would be better to say so. An announcement that the rostered driver is not available as a consequence of a fatal incident earlier in the day, that a replacement driver is on their way and should be with you in 20 minutes would have kept everyone informed and would have stopped this game of social media chinese whispers. Perhaps there might even have been some sympathy with the problems TOCs and their staff face on a day to day basis. Surely an annoucement on board must have been made? Otherwise how would everyone who tweeted know it was a driver shortage? Of course, there might have been a mad scramble behind the scenes to get a replacement driver to the train as soon as they could and so an estimated time of arrival might not have been immediately known. The train was at the station for twenty minutes - I know how quickly that time goes by when involved in trying to sort out such things, so to give accurate information isn't always possible, certainly not immediately. For example, it takes a couple of minutes for the driver to communicate to the guard/dispatch staff that there is no relief for him/her. A couple more minutes radioing/phoning the resource centre to see who should have been there and why they weren't (there could be a multitude of reasons). Several minutes can easily elapse whilst things are juggled about and a replacement driver sourced and told. Then that replacement driver has to get to the train which takes several more minutes depending on where they are at the time. Before you know it, there's your 20 minutes gone! Cancelled due to crew shortage - Friday afternoon - bit chilly for a BBQ?